We don't often post news items but this one is worth a glance. 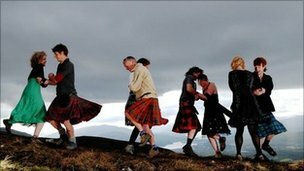 A new report has just shown that in the last year dance was a more popular activity than football in Scotland. You can read the article from the BBC by clicking here. The report comes after a great deal of investment in dance in Scotland. Last year the new Scottish Ballet headquarters in Glasgow won the Scottish Design Awards for best new building. This clip offers a quick look inside. Although the report refers to all kinds of dance, it might be worth mentioning that Scottish Ballet runs extensive outreach schemes including their Associate Programme which offers boys access to professional training. Juniors do not need any previous ballet experience. More on their website. And here's an interview with one of the junior associates who is also captain of his local rugby team: "Dancing helps me leap for the ball at rugby - and the girls at ballet are glad I play rugby as I can lift them up." Watch the clip by clicking here.